Our Recessed Button Ball Lock Pins feature a “cap” surrounding the head- making the push-button recessed. This prevents the actuator button from being accidentally depressed, causing the locking balls to unintentionally disengage. Pin body is heat treated alloy steel for strength and durability. Standard pin finish is Zinc with yellow Chromate. Other finishes available. Cap is mild steel and zinc plated with clear chromate. Ball Lock Pins are a very secure quick-release pin. They have a push button that initiates ball action and retraction, and can only be released by pushing the button. 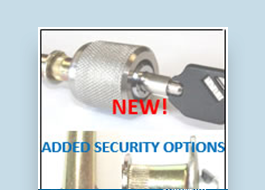 Ball Lock Pin design combines secure fastening with quick release ease of removal. Steel Lanyards or Nylon Lanyards may be added as a low cost tether to prevent loss. Our Recessed Button Ball Lock Pins feature a cap surrounding the head—making the push button recessed. This prevents the actuator button from being accidentally depressed, causing the locking balls to unintentionally disengage. Pivot Point\'s Ball Lock Pin design features both a one-piece, cold-formed body and one-piece spindle for increased durability. Pin body is heat treated alloy steel for strength and durability. Standard pin finish is Zinc with yellow Chromate. Other finishes available. Cap is mild steel and zinc plated with clear chromate. Ball lock pins are also known as positive lock pins, ball pins, double ball detent pins, push button pins, quick release pins, quick pins and hitch pins.